Great White North Technical Evangelist: Appeon Infomaker - Training Video Released! Appeon Infomaker - Training Video Released! 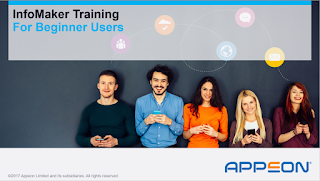 Appeon University has just released a new training video in the InfoMaker product series. The video is called "InfoMaker Training for Beginner Users" * . You can check out the InfoMaker video or the many other product learning videos at the Appeon-U website. Note: * - You will need an Appeon Website login to view the video. You can create a free login when you arrive at the Appeon website if you do not already have one.